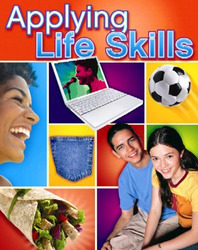 Applying Life Skills reflects the changing times and provides a fresh presentation of Family & Consumer Sciences. Students will practice and apply strategies to focus their reading and improve comprehension. At the beginning of each chapter, Reading with Purpose helps students focus on key concepts developed in the chapter. Students learn and apply essential life skills. How To features offer students practical information and hands-on instruction on topics such as protecting personal identity, staying safe on the Internet, selecting quality clothing, and dealing with bullies. Students use step-by-step instruction from the feature Steps to Success-I Can to practice and apply skills such as taking action against trash, handling stress, being a better listener, and managing time. Teens Speak engages students by presenting real-life, peer scenarios and asking students how they would respond in a similar situation. Character Check features show students how building character traits like being respectful, being responsible, showing self-control, using good manners, and listening can positively impact their lives. Career Link in every chapter focuses on employability skills necessary to be successful while finding and keeping a job. These skills include setting goals, time management, adapting to change, and getting to work on time ready to work.